Above & Beyond - Acoustic. Anjuna Music Store. A beautifully presented photographic journal of Above & Beyond's 2013 acoustic performances at London's Porchester Hall and the LA Greek Theatre, accompanied by a personally written commentary from Jono, Tony and Paavo. 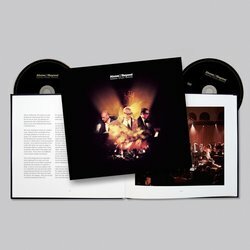 Hard-backed in black Brilliante cloth with gold foil text and full colour dust-jacket, the 56 page book is printed on 150gsm Arctic silk paper with suspended wallets to hold the Above & Beyond Live at Porchester Hall concert film on DVD and the Above & Beyond Acoustic studio album on CD.